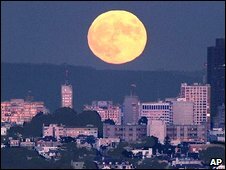 A full moon is set to occur closer to the Earth on Friday evening than it has done for the past 15 years. The Moon's elliptical orbit means its distance from the Earth is not constant. It will be a little over 350,000km away as it passes over the northern hemisphere, which is about 30,000km closer than usual. If the sky is clear it will appear brighter and lighter than usual, say astronomers. Thought you'd enjoy an e-mail that I [and other members of the Authors Guild] just received from humorist and Guild president Roy Blount Jr. [see previous post]. The Guild's staff informs me that many of you are writing to ask whether you can forward and post my holiday message encouraging orgiastic book-buying. Yes! Forward! Yes! Post! Sound the clarion call to every corner of the Internet: Hang in there, bookstores! We're coming! And we're coming to buy! To buy what? To buy books! Gimme a B! B! Gimme an O! O! Gimme another O! Another O! Gimme a K! K! Gimme an S! F! No, not an F, an S. We're spelling BOOKS! PPS from Marie: Well, I posted it without asking. Today I received the following message from the writer Roy Blount Jr., who is president of an organization I belong to -- the Authors Guild. I'm sending it along to you because you are not only my readers, but you are surely just plain READERS too, and Roy's letter is full of great suggestions for you. The photo was copied from Amazon.com, where you can order my book if you haven't already read it. But as the message below explains, buy it [and other books] at your neighborhood bookstore. Having my book sell would be nice for me. But I'm mainly writing to share the larger message. Books and bookstores are becoming endangered species. As a writer, therefore, I am an endangered species too. SAVE US! P.S. Our two red-heads, the Red-headed Woodpecker in the Locust Grove and the red-phased Screech Owl , seem to be settling in for a long Central Park stay. The other day photographer Murray Head sent me the photograph below, taken in Central Park on December 3, 2008. An immature [not quite red-headed] Red-headed Woodpecker has been resident in the Locust Grove [the wooded strip just west of the Great Lawn]for more than a week. This is a most unusual bird for Central Park, indeed, for the entire Northeast, and its presence in the park is attracting birdwatchers from all over. Photographers too. As you can see from the photo above, the woodpecker was gathering acorns. It was very territorial and chased anything away that came close to its storage trees including other birds and squirrels. Here's the story: Tom and his friends, while searching for a rare bird in the mountains not far from Bogota, had been kidnapped by a band of guerrillas and held for ransom. Incredibly, Tom escaped from his armed guard ["with the wherewithal that might do Indiana Jones proud", as the New York Times wrote] and made his way through the jungle to safety. His companions were released a week or so later. Tom returned to New York from Colombia on April 3 and was in the park the very next day, eager to show Central Park's unusual avian visitor to a television crew covering his amazing story. Though there have been occasional brief sightings of Red-headed Woodpeckers during the last decade, none of that species has spent the winter in Central Park since 1998.